The SUV realm is big, very big, but whether they are subcompact, compact, mid-sized or full-sized, some successfully stand out within this vast array of choice. 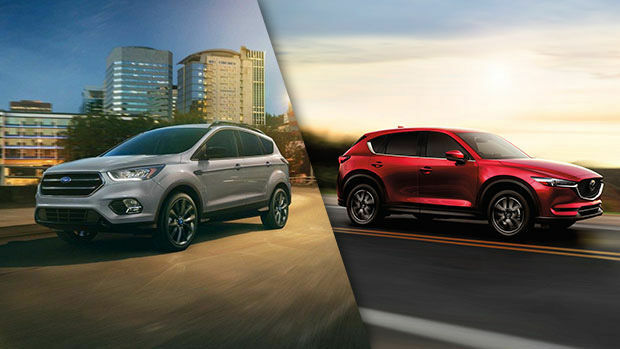 This is evidently the case for one of them, which reigns in the compact-size class, the 2018 Mazda CX-5, opposed here to the 2018 Ford Escape in the following comparison. This compact SUV, frequently seen in the great metropolitan region, features among the 3 finalists for the title of World Car of the Year, according to the World Car Awards. The WCA is an international non-profit association composed of several renowned automotive journalists, 48 in all, from Asia, Europe and North America. Being among the world Top 3, now there’s something exceptional, especially when we take into consideration the number of vehicles riding on the planet. The 2018 CX-5 is proposed in 3 versions; the GX, starting at $27,795, the GS starting at $31,395 and the GT starting at $36,995. The 2018 Ford Escape, for its part, offers 4 models, namely the S at a suggested starting price of $27,094, the SE at an MSRP of $29,344, the SEL starting at $31,094 and the Titanium starting at $38,194. Let us now examine the characteristics featured on the CX-5 and that are lacking on the Escape. The highway fuel economy is greater at 7.7 L/100 km against 8.1 L/100 km, the global rating awarded by the automotive journalists from the Car Guide is at 87% for the Mazda, as opposed to only 75% for the Ford, it has G-vectoring Control, the Mazda unlimited mileage warranty and still much more. Let’s also mention the particular driving dynamics that only the Japanese manufacturer knows how to inject into all its vehicles, which neither Ford nor the other competitors have been able to imitate. In a nutshell, if you are looking for an SUV that will not only match your expectations, but also surpass them, come take a look at our 2018 CX-5 models at your Mazda dealership. Located in Lachine, we have several units of CX-5 in inventory and we will be happy to tell you about the great number of Mazda financing possibilities, within reach of any budget, and don’t miss our Mazda promotional offers. Come see us without any more delay!